Advanced attacks on an organization’s digital assets often leverage multiple vectors, spanning network, endpoint, web, and email systems. Security professionals who adopt point product technologies, such as endpoint antivirus, often find limited success when these tools lack a holistic view of their environment. 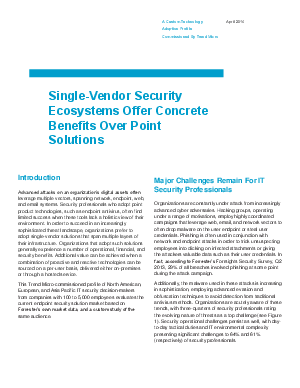 In order to succeed in an increasingly sophisticated threat landscape, organizations prefer to adopt single-vendor solutions that span multiple layers of their infrastructure. Organizations that adopt such solutions generally experience a number of operational, financial, and security benefits. Additional value can be achieved when a combination of proactive and reactive technologies can be sourced on a per-user basis, delivered either on-premises or through a hosted service.